Preheat oven to 400 degrees. Cut off brown ends of sprouts, slice in half and lay face down on baking sheet. Dice onions and sprinkle on baking sheet. Place in oven for 20 minutes. After 10 minutes of baking, add grape tomatoes and bake the remaining 10 minutes. 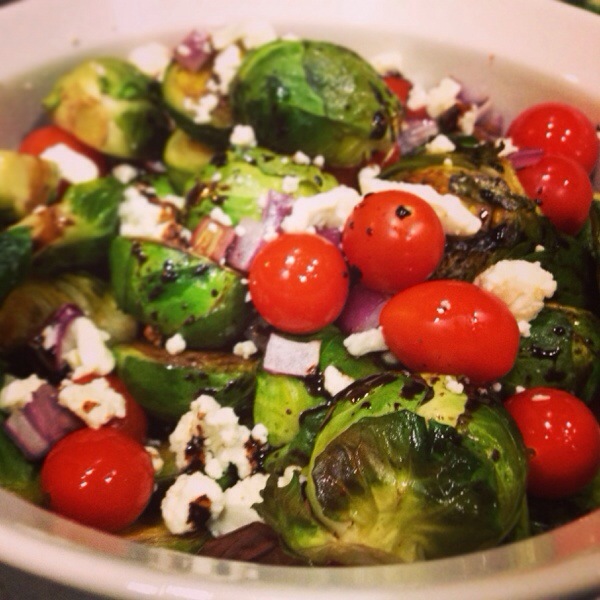 When done, scoop into a bowl, sprinkle with feta, and drizzle with balsamic reduction. For balsamic reduction: pour balsamic vinegar and sugar into a small pan and whisk on high until thick and syrupy, about 5 minutes.